Today we will talk about the fungal infections occurring in the scalp and beard. Both these places have hair and the fungal infections occur in these two places are almost same and the treatment is also similar. Fungus infections occurring in the head are called TINIA-CAPITIS and fungal infections occurring in beard are called TINIA -BARBAI. We all know that the fungus is a seeming disease and can be spread from one to the other in the house by using each other’s clothes, towels, brushes etc. The fungal infections in the head are more happens in school going children. Those who sit and play together by combining their head in school. And the infection in the beard often happens to young aged boys. This infection generally happens by using each other’s cushions and towels in home. 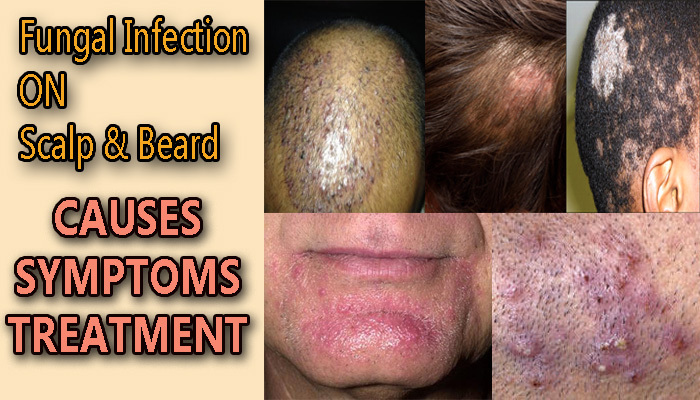 There is one more thing that people who keep a long beard or whose beard is quite dense and do not clean it properly, then this type of fungal infections often happen. If the barber shop you are going does not clean their tools properly or using one shaving blade to multiples then fungal infection on your scalp or beard may occur. Scalp becomes dry and there is also a lot of itching. Hair starts falling in a spherical shape in beard. Skin became reddish and there is also a lot of itching. Friends, now we will talk about how to treat fungal infections in scalp and beard. Both of these infections are treated in the same way. You can also use cream or gel in it, but the treatment will be cured completely only by eating. The tablets that are used in the treatment of this fungal infections are called GRISEOFULVIN, FLUCONAZOLE and TERBINAFINE. You must take these medicines for at least 4 to 6 weeks. Along with eating medicines, you must also apply anti-fungal cream to your infection to get faster results. Some anti-fungal creams are CLOTRIMAZOLE or MICONAZOLE CREAM. Apply this daily for 2 to 4 weeks in affected area. Apart from this, you can wash your beard and your scalp well with 2% -CYTACONAZOLE lotions. Do this method in this way, first wash your beard or scalp and put 2% -CYTACONAZOLE lotion well in it like soap. Leave it for 5 minutes and wash it well with lukewarm water. This will greatly help you to recover your infection quickly. Comment down below if you have any questions, we will definitely answer you.